The life of Carl Sagan now fills the tabletops of two vast rooms in the Madison Building of the Library of Congress. The life arrived in recent weeks at the building’s loading dock on 41 pallets containing 798 boxes. Sagan famously talked about billions of stars and billions of galaxies, and it appears that he saved roughly that many pieces of paper. 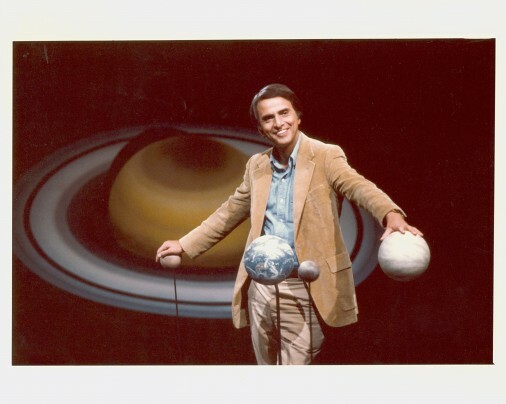 The material documents Sagan’s energetic career as an astronomer, author, unrivaled popularizer of science and TV star, and it ranges from childhood report cards to college term papers to eloquent letters written just before his untimely death in 1996 at age 62. Also in the mix are files labeled F/C, for “fissured ceramics,” Sagan’s code name for letters from crackpots. Until recently, all this stuff had been stacked in filing cabinet drawers in the Sphinx Head, a tomblike secret-society building that became Sagan’s home in Ithaca, N.Y. For years, Sagan’s widow, Ann Druyan, had carefully preserved her husband’s archive, hoping to find an appropriate repository. The Library of Congress had long been interested; the library owns the papers of such innovators and scientific luminaries as Alexander Graham Bell, the Wright brothers, J. Robert Oppenheimer, E.O. Wilson and Margaret Mead. Now comes the arduous task of sorting through it. The boxes fill two sprawling rooms. The organization of the archive is expected to be completed by November 2013, at which point the material will be open to researchers. Library officials let a Washington Post reporter spend a couple of hours going through a few select boxes. Sagan was, one quickly discovers, a phenom. “If you wish to gain information concerning anything, go to Carl Sagan. He is Noah Webster, Einstein, and a walking encyclopedia all rolled into one. (There is a streak of John Barrymore in his nature, also. ),” wrote the student newspaper at Rahway (N.J.) High School in 1950. The archive includes documents related to Sagan’s controversial hypothesis that an all-out nuclear war would result in a “nuclear winter.” It also includes letters to and from Sagan during a painful episode when the National Academy of Sciences declined to extend him membership (some scientists had sniffed that Sagan was a popularizer whose scientific work wasn’t of the highest merit, but other colleagues defended him, noting, for example, that he did early, significant work showing that a greenhouse effect broiled the surface of Venus and that dust storms on Mars explained changing features seen through telescopes. In the papers, we see Sagan imagining life not only on Venus and Mars but even beneath the surface of the moon. That’s the young Sagan, fresh out of the University of Chicago. We also see the mature Sagan pondering the tendentious issues of God and the relationship of science and religion.